Keyboard shortcuts are an incredible time saver. Sure, navigating with the mouse is fun and easy, but using keyboard shortcuts takes your navigation to a whole new level. When it comes to the most popular web browser i.e. Google Chrome; well, it has a lot of amazing keyboard shortcuts. In fact, you might as well be using some extremely common ones like Ctrl+T to open a new tab or Ctrl+N to open a new Window. 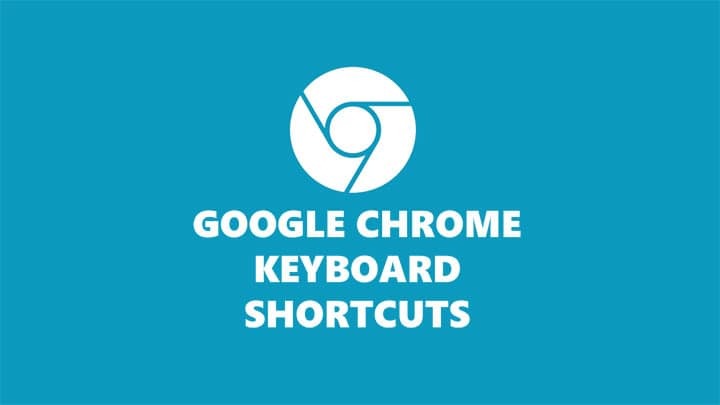 But, in this article, I will share with you some more incredibly useful Google Chrome Keyboard Shortcuts keyboard shortcuts that will make you the master of Chrome. To open a new tab, press Ctrl+T. And, to close the current tab, press Ctrl+W. If you want to close the complete window, press Ctrl+Shift+W. To reopen a recently closed tab, press Ctrl+Shift+T. Keep using the key combination to open multiple tabs in the same order they were closed. Google Chrome offers two ways to switch between apps. You can either move to the immediate left or right tab, or you can move to any open tab directly without opening any tabs in between. To move to the immediate left, use the key combination of Ctrl+Shift+Tab. To move to the immediate right, use the key combination of Ctrl+Tab. If you want to move to a certain tab, use the key combination of Ctrl + a number. For example, if you want to move to the 6th tab, press Ctrl+6. This trick works only if the open tabs are in single digit i.e. 1 to 9. To open a link in a new tab, press the Ctrl key while clicking a link with the cursor. Use the key combination of Ctrl+Shift while clicking a link to open it in a new tab and directly jump to this tab. There’s an easy way to type anything on the omnibar without clicking it with the cursor. Simply use the key combination of Ctrl+L and type anything you want. One of the worst things that you can do while browsing a web page is zooming in way too much. This simple key combination of Ctrl+0 (zero) can reset the zoom to default i.e. 100%. And, the key combination of Ctrl + the plus key and Ctrl + the minus key can be used to zoom in and zoom out respectively. You may already know this, but if you don’t; well, you can use the key combination Ctrl+D to bookmark the current page. And, Ctrl+Shift+O shows you the bookmark manager. Clearing the browser data via traditional methods involves multiple steps. A simple key combination of Ctrl+Shift+Delete can do it instantly. So, the above mentioned are some of the most useful Google Chrome keyboard shortcuts. If you know some other awesome ones, do share with us in the comment section.